On Sunday 23 March 2008 the artist covered his entire body with honey and gold leaf for a private performance in which he was to be buried alive by his wife and a close group of friends. 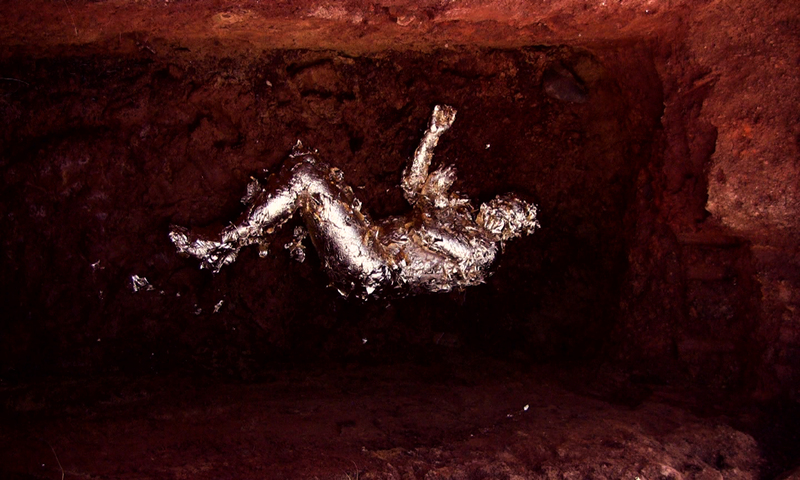 In the resultant artwork the viewer witnesses an unseen hand slowly covering a golden figure lying in a foetal position at the bottom of a full-scale grave. 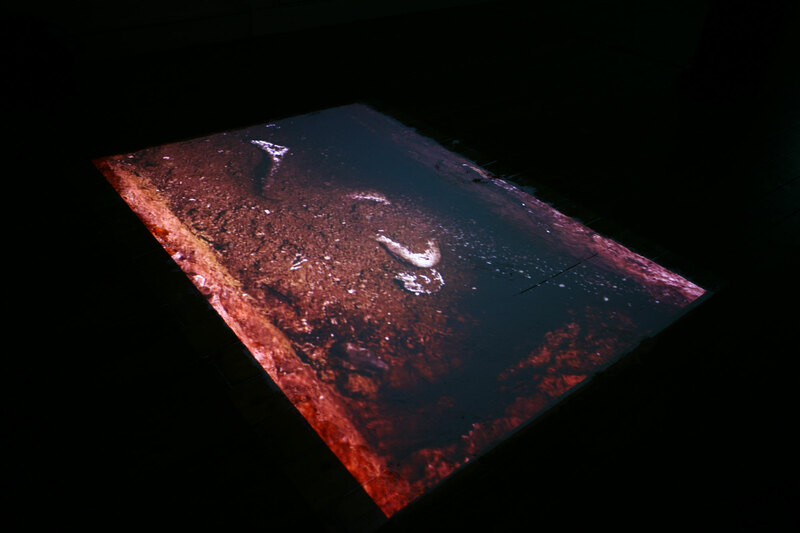 The work is strangely hypnotic, with the repetitive sound and motion of the spade and red soil creating for a meditative viewing experience, an effect further accentuated by the slow transformation of the visual image. 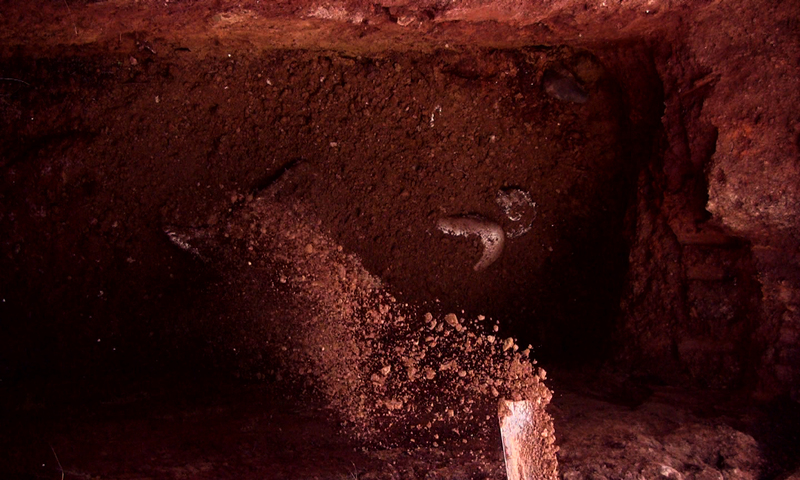 The combination between the golden figure, soil and the foetal position serves for the emergence of a variety of interpretative strands, all seemingly archaic/ or mythic in origin: the so-called ‘bog figures’ from northern England come to mind as do the Inca and Egyptian burial customs, the symbolism of gold in the Ashante worldview (Africa), the usage of gold leaf in Renaissance painting and Asian religious iconography, and more close to home, the history of the discovery of gold in Johannesburg, South Africa (where the artist currently lives and works). 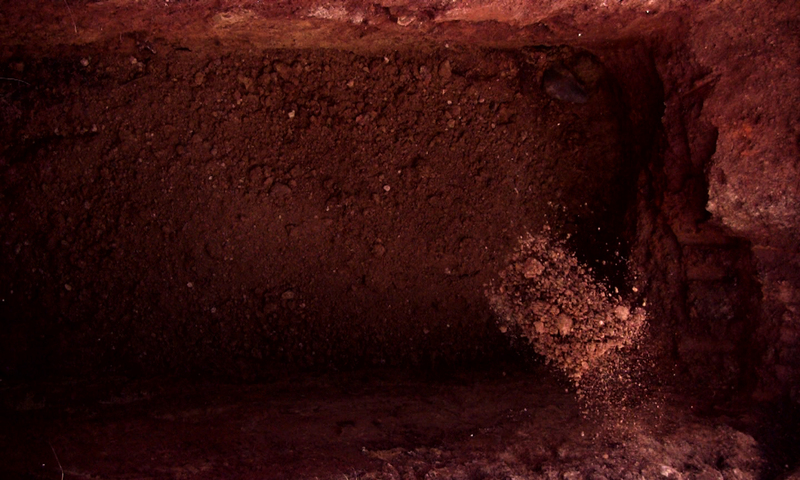 The video cuts to black moments before the golden figure breaks through the layer of soil, breathing easy once again. The work was originally commissioned for the group exhibition ‘JOZI and the Mother City’ curated by Carine Zaayman and held from 8 -26 September 2008 at the Michaelis Gallery, Michaelis School of Fine Art, Cape Town. Artists included Ralph Borland, Nicola Grobler, Stephen Hobbs, Svea Josephy, Marcus Neustetter, Sean O’Toole, Nathaniel Stern, Johan Thom, James Webb, and Carine Zaayman. (Catalogue). The work is homage to the performance ‘Challenging Mud’ (1956) by Guitai artist Kazuo Shiraga (1924-2008). For exhibition purposes the work is projected, life size, onto a thin layer of flour covering the floor.